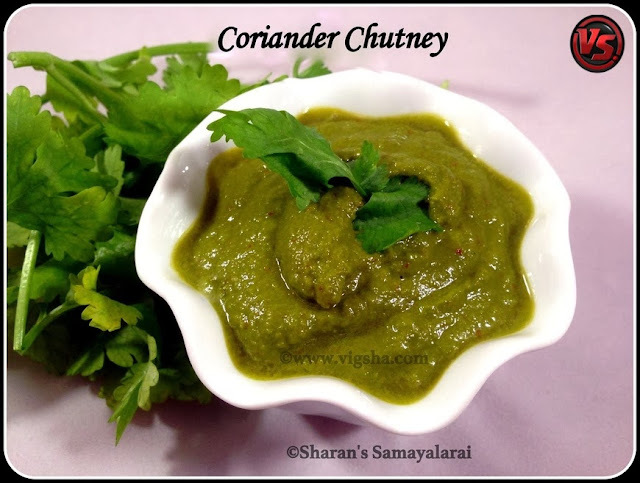 Coriander chutney is delicious with simple flavors. It goes well with tiffin varieties and also as a dip/spread for sandwich. Coriander leaves have an unique fragrance that makes the dishes taste delicious and aromatic. Coriander leaves have health benefits too. They are rich in iron, Vitamin C and Minerals. My mom makes Coriander thogayal often, it suits best with rice & a dollop of ghee. I have altered the recipe to suit tiffin varieties. 1). Heat Oil in a pan, add Urad dal and saute till it becomes golden brown. Then add red chillies, onions and ginger, saute till the onions turns pink. In low flame, add the coriander leaves, give a quick stir and switch off ! 2). Once the sauteed items cools down, transfer the contents to mixer. Grind it to a fine paste along with salt, grated coconut and little water. I served it with Oothappam ! # For nice vibrant color, use green chillies instead of red chillies. # Adjust spice levels to suit your taste. # Do not discard the stem, it is rich in fiber. Just cut the root part and use the rest. # Tempering is optional. if you prefer, do the tempering with gingelly oil and top it on chutney.